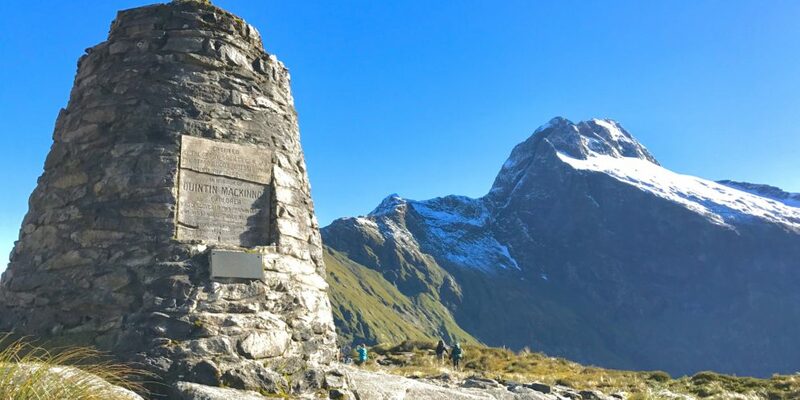 The Milford Track is one of New Zealand’s nine Great Walks and is located in Fiordland National Park on New Zealand’s South Island. 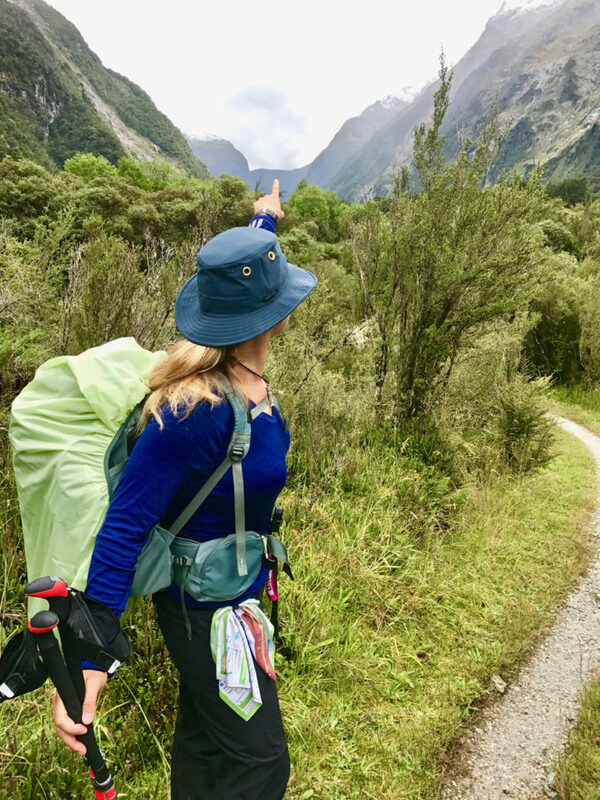 It is a very popular one-way, 33-mile/ 53.5km, 3,000 m/ 10,000 ft. cumulative ascent and decent, 4-day, hut-to-hut trek from Lake Te Anau to Milford Sound. 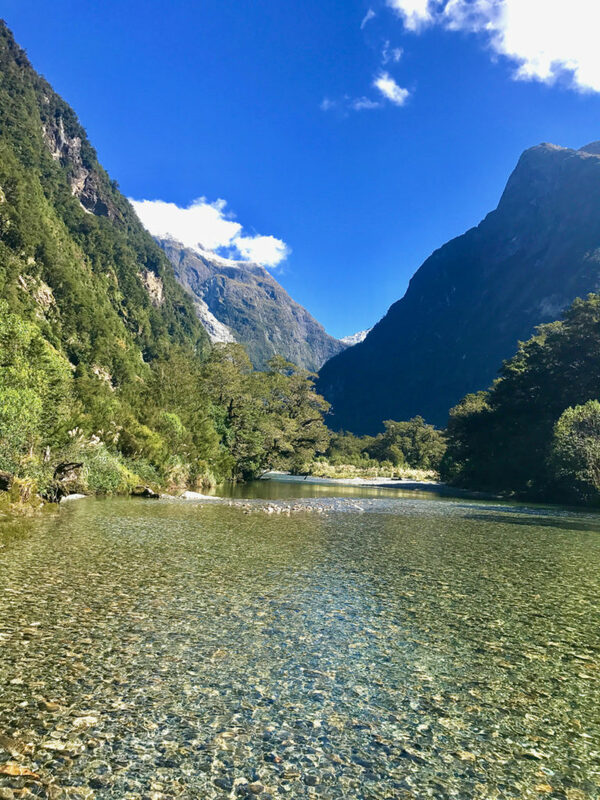 The Milford Track takes you through beech forest, valleys, alpine tussocks, across crystal clear rivers and up and over the impressive Mackinnon Pass 1154m (3786 ft.). 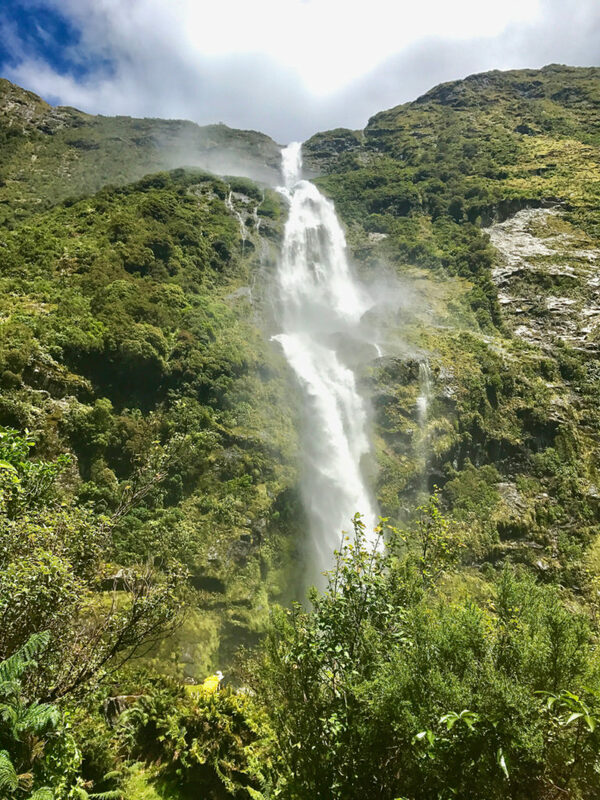 Don’t miss taking the side trek, to see up close, Sutherland Waterfall 580m (1906 ft.), one of the world’s highest waterfalls. 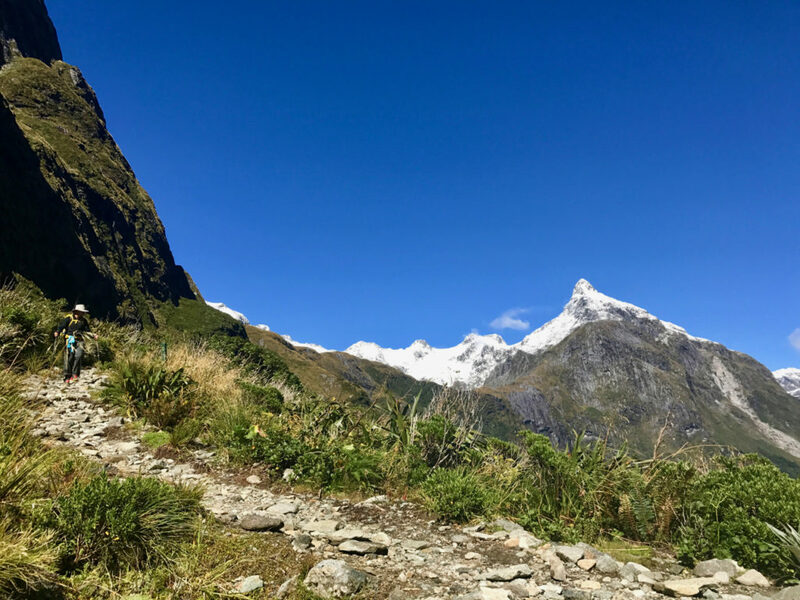 The biggest challenge to hiking the Milford Track, besides the ever-present sandflies, is booking hut and ferry reservations and managing transportation logistics. Hut and ferry reservations must be made ahead of time. Camping is not allowed and because of trail restrictions, permits and transportation, in peak season, you have to do the trek in 4-days Since the trek starts and finishes in different locations, you also need to deal with your car or figure out the bus schedule. Here is how we did it and what you need to know! 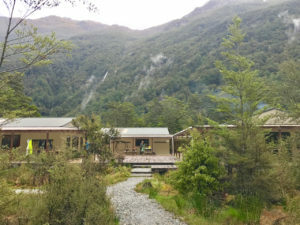 New Zealand’s Department of Conservation maintains 4 huts on the Milford Track. Each hut has a kitchen/dining area with sinks, gas burners (cooking pots and food are not provided), a wood stove and bathrooms, no showers. Each bunk has a simple mattress. The rate is NZ $70 per adult, per hut. Children, 17 and under, stay for free. Hut Reservations must be booked ahead of time and can be done online or at a DOC visitor center. Once confirmed, pick tickets up at a DOC visitors center and take them on the hike. The Hut masters/rangers will ask for them. Ferry/Boat Transfers must be booked ahead of time. Fiordland Watertaxi offers transportation from Te Anau Downs to Glade Wharf (trailhead start). 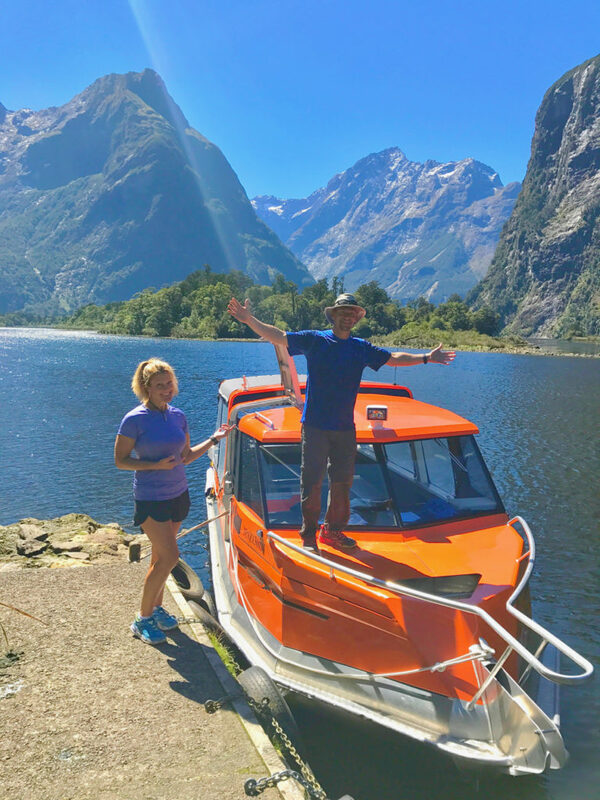 The DOC manages ferry/boat bookings from Sandfly Point (trail finish), at the end of the track, to Milford Sound. Expect to pay between NZ $180 and NZ $210 for round trip transportation. A - Reach out to EasyHike, an adventure travel logistics company that works with the DOC and Great Hikes to see if they had any reservation cancellations. B - Go with a guided tour that has their own huts on the trail. I didn’t want or need a guide. They are also way more expensive, but the huts are nicer and they feed you. We went with Option A - EasyHike. Coincidentally, they had a cancellation and were able to transfer the reservations to us. They also transported our rental car from Te Anau Downs to Milford Sound. No bus required! 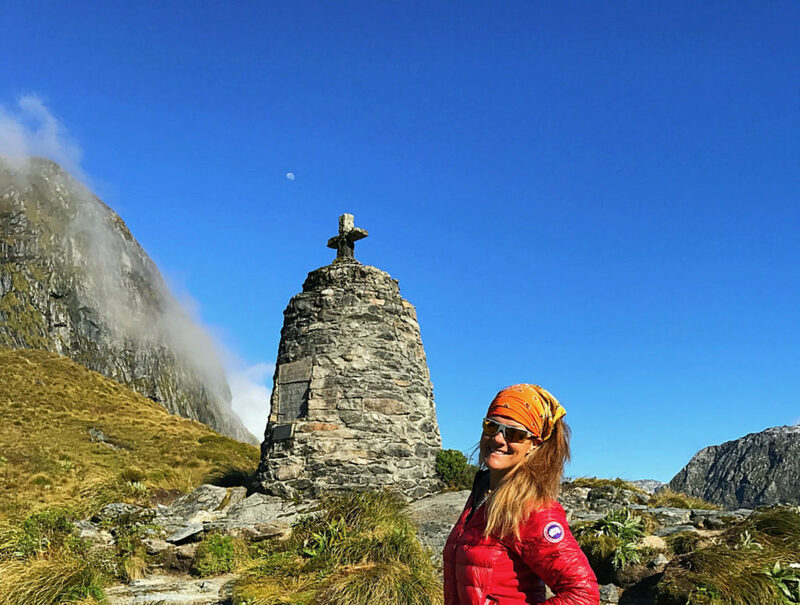 EasyHike is a one-stop-shop, hassle-free company that offers several hiking packages for traveler who don’t want to stress over logistics, have proper clothes/gear or time to shop for food supplies. They can provide all these things! 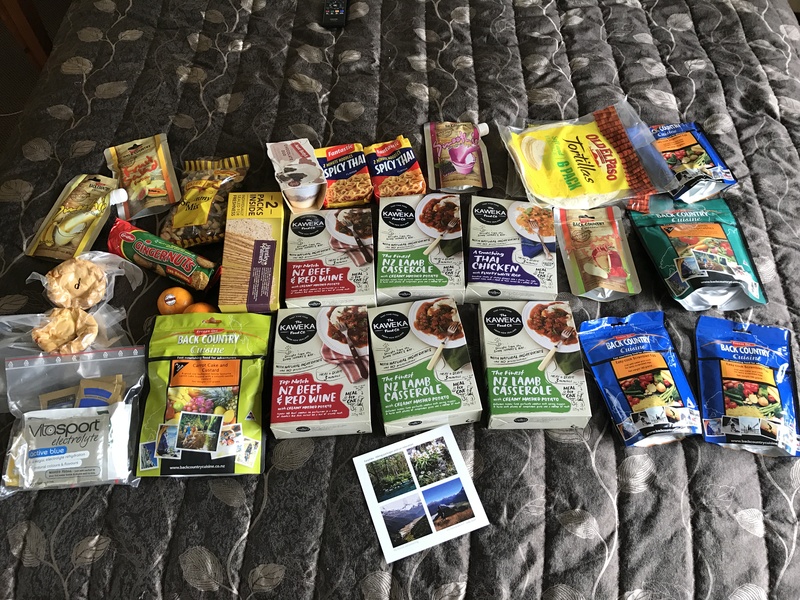 We decided to try their package that provides food and they hooked us up! We ate like kings on the Milford Track. EasyHike saved us time, money and really made our trip easy. All we had to do was pick up our permits, meet the ferry and hike. We rented a car from Avis at Queenstown airport and drove to Te Anau, NZ. It is a pleasant two-hour drive through rolling hills, farms and fields. Te Anau is a great little ‘base camp’ town for Fiordland National Park. If you need to buy anything for your trek, they have an outdoor retailer and a Four-Square grocery store. There are also plenty of restaurants and hotels. We picked up our tickets, the day before our trek at the DOC visitor’s center and spent the night in a hotel. The next day, we drove 20-minutes north, to Te Anau Downs, to meet the ferry at the pier. You will be assigned a specific time to meet the ferry - Do not miss it! If going in high-season, I recommend booking months and months in advance. Don’t wait to get to the visitor’s center. If you don't want to hassle with reservations or logistics, book a package with EasyHike. 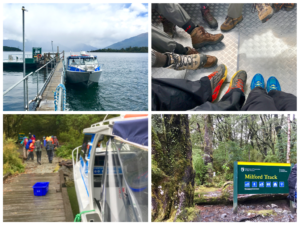 The ferry ride from Te Anau Downs to the start of the trek is an hour. Make sure you go to the bathroom before getting on the boat. Some boats do NOT have a bathroom. You don't need heavy trekking boot. Wear shoes with good traction. We hiked in Hoka One One trail running sneakers. Back Country Cuisine and The Outdoor Gourmet make really good dehydrated meals and can be bought at the outdoor store in Te Anau. The sandflies are no joke. Absolutely bring bug spray, with DEET. Don’t even bother with natural repellent. The sand-flies will laugh at you. Our ferry left Te Anau Downs at 2:30pm. After a bumpy, hour-long boat ride, we set foot on land at Glade Wharf. A big welcome sign points to the trail. It started raining, of course - because that is what it does in New Zealand - so we put on rain gear and headed down the trail. A lush beech forest led to a clearing, then more trees and the Clinton River. It is an easy hike and took 45-min. to reach Clinton Hut. Clinton Hut has two separate dorms with bunk beds, a separate kitchen/dining area and bathrooms. There isn’t much to do once you reach the hut, aside from eat, sleep, socialize, read old magazines and informational literature about the area. You can wonder around outside, but if it isn’t raining, the sandflies will drive you back indoors. Don’t forget bug spray! The hut master/ranger will collect tickets and at 7:30pm, give an informative speech about the area and weather report. We slept great and were on the trail by 8:30am. It is another easy hike. 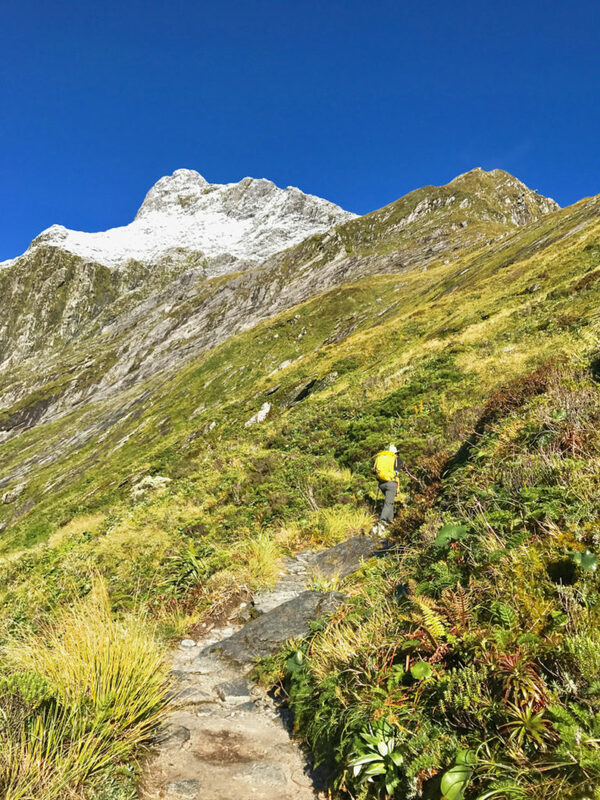 Elevation gradually increases after trekking through a tussock valley, surrounded by cliffs and scattered waterfalls. In the distance, you’ll see MacKinnon Pass - climbed the following day. Weather was nice, until the last hour of the trek. Then it started raining again and temperatures dropped. We are faster than average hikers and were glad to arrive at Mintaro Hut in 4.5 hours. We were the first to arrive and with provided wood, started a fire in the stove to warm the kitchen/dining area. 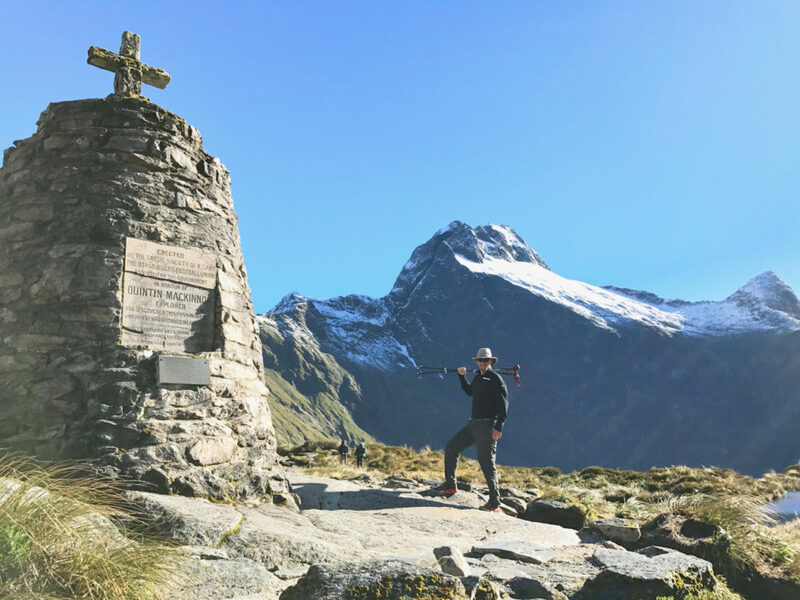 Guidebooks recommend it takes 6 hours to reach Mintaro Hut and this was true for many of the hikers. The hardest day on the track, because of the ascent and descent, is also the most scenic. We lucked out and hiked MacKinnon Pass on a beautiful, sunny day. Expect lots of switchbacks going up the pass and down. We spent an hour at the top enjoying panoramic views of distant now-capped mountains, Clinton Valley and taking pictures of the monument. After passing the highest point on the trek, MacKinnon Shelter, we started the long descent. About an hour from Dumpling Hut, there is a turn-off to trek to the famous Sutherland Waterfall. Do it! It’s a bit of climb, but worth it. It took a little more than an hour, round-trip. We reached Dumpling Hut 6-hours after leaving Mintaro Hut. This includes our side trip to Sutherland Falls. Again, we were the first to arrive. The ranger recommended a 2-minute hike to reach a rocky beach area on the river. It was hot and we were all for it. We cooled off in the river and attempted to relax on the beach.The sandflies were terrible and we retreated back to the hut. The last day on the track was hot and had more of the same scenery. Beech forests along Arthurs River, more waterfalls and a dirt track to the boat shed on Sandfly Point. It felt longer than 18km. Maybe we were just anxious to get away from sandflies and get a shower. We reached Sandfly Point in 4.5-hours and waited only 30-minutes for the early boat to take us to Milford Sound. A 20-minute boat ride later and we were back in civilization. The other Milford Track hikers had to wait for a bus to take them to their final destinations. Thanks to EasyHike, we picked up our car keys at a designated counter in the visitor building. Our car was waiting in the parking lot. 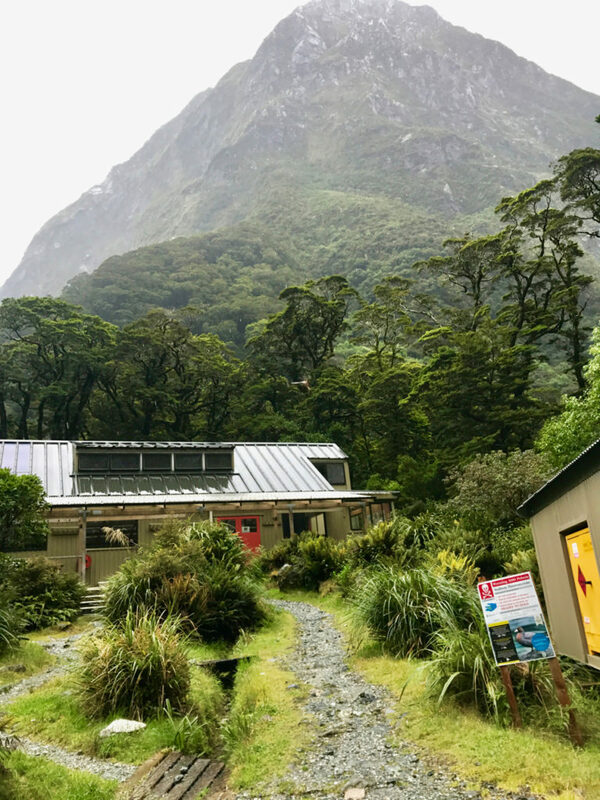 EasyHike also recommended, and made reservations, for us at the famous Milford Sound Lodge - a short, 5-minute drive. It is remote, a bit pricy, but a nice treat to end the trek. It rains over 200 days a year in Fiordland National Park. Bring a rain jacket and pants. 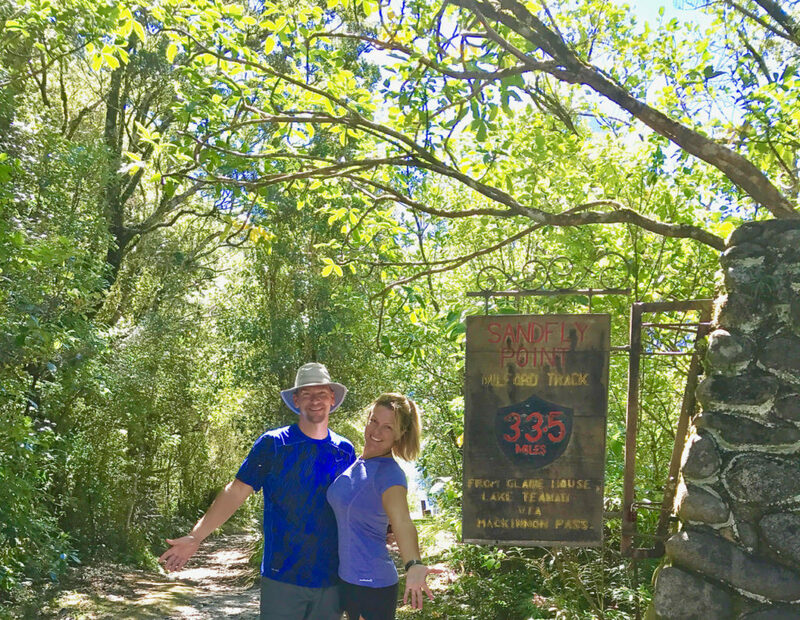 We spent sixteen days on the South Island and completed 10 different treks, hiking over 110 miles with 34,000 feet of elevation gains and losses. 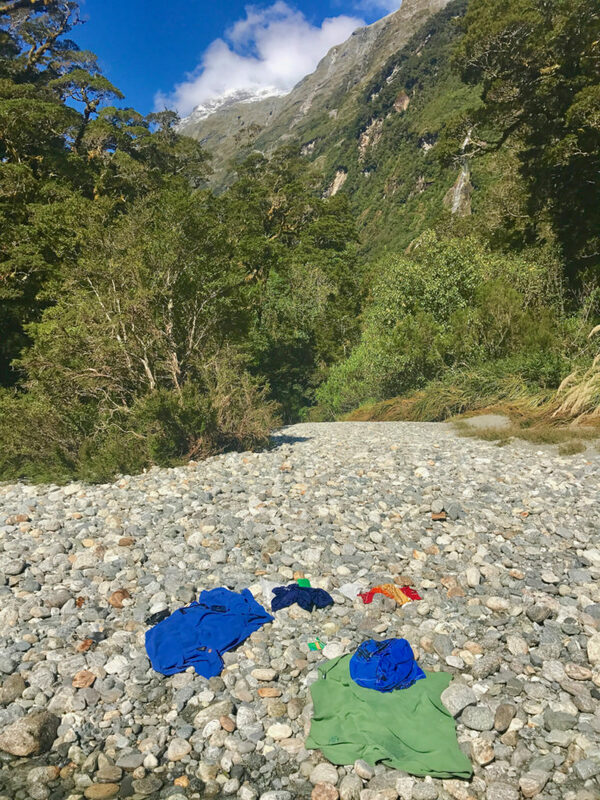 The Milford Track was our last adventure in NZ. We liked it and recommend it if you can get reservations.